Adromischus cristatus growing subshrub succulent of the genus Adromischus, Adromischus cristatus perennial evergreen used as ornamental drought tolerant plant, can grow in mediterranean, desert, subtropics or temperate climate as houseplant and growing in hardiness zone 9-11. Leaves color green, leaves can be with prominent edge and in wedge. Flower color white the flowers shape its pipe with entrance in star shape. 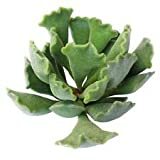 Succulent plant, Adromischus Cristatus or Key Lime Pie fat little leaves with ruffled edges. 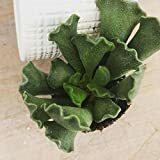 ADROMISCHUS CRISTATUS, THE FRIED PIE PLANT, ROOTED PLANT! SHIPPED IN IT'S POT!